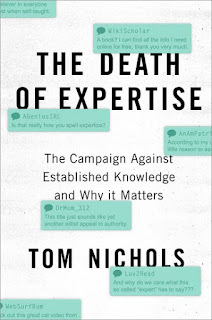 I'm pleased to share this transcript of our discussion with Tom Nichols, author of the new book The Death of Expertise. It's lightly edited. Please don't quote it without checking with the author. I'm grateful to our Editorial Assistant Hannah Reed, and Managing Research Assistant Adam Turosky, for working on the transcript. We had some audio problems (as you will see), but it's a key issue, brilliant book, and was a fascinating call! Good afternoon, ladies and gentlemen, this is Nigel Cameron from the Center for Policy on Emerging Technologies, we're glad to welcome you to this teleconference. We just finished a series of three, some of you will have been with us in those, on critical infrastructure resilience issues. We have a series upcoming which has yet to be announced on innovation for global development, which our senior fellow Dr. Nagy Hanna will be co-hosting; and next week, for those who have not yet picked this up, in fact this time next week we have a teleconference with Dr. James Giordano from Georgetown on neuroscience, particularly looking at the implications of neuroscience for military, political, and other questions. So, we hope some of you will be able to join us then. As usual with these calls we circulate a report or a transcript, so that those who aren't able to participate can do so in other ways. Delighted today to welcome Tom Nichols, professor of national security affairs at the U.S. Navy War College. He has many other claims to fame, but most recently is his new book, "The Death of Expertise," which came out just a few weeks ago, which I certainly enjoyed reading. The subtitle is "The Campaign against Established Knowledge and Why It Matters." And this plainly is a timely book, it's a very timely conversation. One of our interests at C-PET is not simply in the technical questions of technology policy, it is in the broader context in which those public grasp of the significance of these issues, and plainly the issues of public intellectuals, public discourse, how claims to knowledge should be viewed, this is all very germane to the context in which C-PET operates. For those who don't know C-PET, we've been going now for ten years, this is our tenth anniversary coming up. Our concern is for the long term impacts of technology and its broader implications for society, for policy, plainly, but also for business and the integrated questions raised by technology. I'll say one or two more things about C-PET since we have a sort of promotional opportunity; one of the areas where we have been focused, partly because it's such a significant complex example of the impact of technology, is the internet of things. In fact, we co-hosted the first ever DC conference on IOT, six or seven years ago, and we've been partnering more recently with Forum, which is a European based conference organization, and we have two upcoming events in Brussels, for those who would like an excuse to go and spend some time in the complass(?). In just a couple of weeks' time, IOT at the IOT European summit, and then a couple of weeks later a one day event on connected cars, which has been spun off from the IOT, IOT Summit process. Tom, do introduce yourself and let's see if we can make a start. 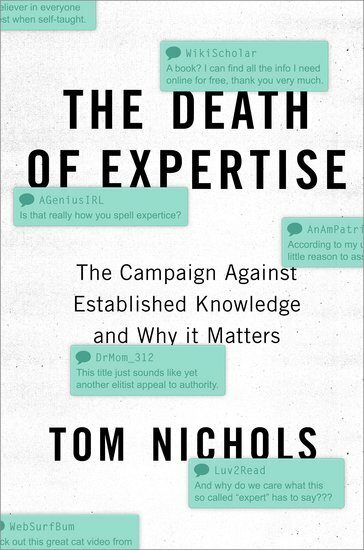 Hi, everyone, Tom Nichols here, the author of "The Death of Expertise", can everyone hear me? Well, they're all muted so they can't say, but I suspect they can, this is coming through loud and clear for me, so just carry on. The floor is yours. Okay. So, I assume the goal here is I'll talk for a bit about the book for a few minutes and then some Q&A? Okay. Well, thanks everybody. Well, I've written(?) a book, which is called "The Death of Expertise: The Campaign against Established Knowledge and Why It Matters", actually from, not from anything in the past few years, it has nothing to do with the election, although I talk about the election towards the end of the book, it happened as I was finishing the book, it came up because even thirty years ago when I started as a young expert in Washington, I was interested in the way people would simply argue with experts, as though they themselves were peers. But I sort of filed that away in the back of my head, I said, 'well that's sort of a natural phenomenon(?) in our culture, just the way we are'. What I found over the past decade or so, in the past fifteen or twenty years even, is that people are increasingly argumentative with experts as though they were peers, as though they knew more than experts, and the way I sum this up in describing it many times, is that people find out I'm an expert on Russia, and I speak Russian, and I've been there many, many times, I've written books about it, and they say, 'Oh, you're an expert on Russia? Let me explain a few things about Russia to you! ', and of course, it's (POOR AUDIO) you find yourself kind of gob smacked, where you find yourself being lectured by someone who has no idea what they're talking about. As I wrote about this actually in the wake of the Snowden(?) business, about three or four years ago, I kind of blogged it out one day as a sort of therapy for myself and that got picked up by a magazine as a short article, and what I found (POOR AUDIO) would be that popular, I figured it sort of fell into the category of 'old man yelling at the clouds' kind of thing, but that after I published that, and people were, you know, questioning me on Russia and the CIA and the intelligence community, really had no idea what they were talking about. What I found was, experts in other fields started reaching out to me and saying, 'My god, we've have the same experience, we've gone through this', this is, there are unbelievably painful things, doctors in particular became a big constituency for the book, but there were others: lawyers, engineers, I got a letter from a molecular biologist in France who asked me if he could translate it to French and could circulate it among his friends who were arguing with him about science, and the thing just took off and then one day Oxford actually reached out to me and said, you know, you wrote this piece, the world seems to be talking about it, and in fact, the piece itself went viral, well over a million views individually, not hits, but actual visitors to the piece within about a year or so, and so I sent out a local book and I basically have(?) the problem, I layout some influences in modern American and modern, I would say, Western life that I think contribute to this and I don't come up with much of a solution. I think one of the ways I've been pulled up short is I don't have much to offer other than that experts communicate better than the public and the public needs to inform itself more about (POOR AUDIO) but I'm not sure that I had much more to say that wasn't pessimistic. I think, as I've said many times, the thing that will end all the anti-vaxxer stuff, for example, will be a pandemic, at which point arguing with doctors will seem kind of silly. The three culprits I tend to identify are really just emanations of a single problem, which I argue, is a culture of narcissism in the United States. I am certainly not the person to come up with that, Christopher Lasch talked about it forty(?) years ago, Robert-his name just flew out of my head, Robert Hughes talked about it in "Culture of Complaint", and others are known for this as well, but I look(?) at how that has been furthered and made more powerful by things like the nature of the modern education system, the modern university system, that panders to students, treats them as clients, asks them to evaluate professors like evaluating restaurants. I talk about the media and the failure of journalism and the segmenting of the media into court(?) chambers where people can go listen to their preferred ideological views without ever having to encounter a fact or a thought they don't like, and of course, I talk about the internet, which has become this kind of massive bazaar of flaming dumpsters of nonsense in all directions where people think that they're getting informed. I just, before I was talking to all of you folks, I was on a Canadian radio station, I'm in Canada right now, and people said, well, you know, people called in and said, well why should I listen to you? Everything I need is at my fingertips on the internet. And, you know, it didn't go over well, to have somebody like me say, no, it isn't. You don't know what you're doing, you don't know what you're reading, you don't know how to discriminate among the sources you're using; it's possible that by surfing the internet you may even be dumber on any given topic than you would have been had you done nothing, because you now have gone from not just not knowing things, but now you've gone one more step to knowing things that are actually wrong. And so, I talk about all three of those influences throughout the book, why I think they've become more pronounced during this last ten years, and this last election. I mean, I do talk about the election to some extent where this and the Brexit campaign bolstered(?) that people really don't want to be, they don't want to hear anything that conflicts with what they believe. They want to scapegoat experts for problems that they may be having with the global economy, with things they think in foreign policy aren't going well. I have a whole chapter in the book from when experts are wrong, and how experts can be wrong, and why they're wrong. This last election really, to me, proved that there's a real power in just going out there and telling people they're not responsible for anything and that shady(?) conspiracies of experts are out there to mess up their lives. So, let me just kind of stop groaning(?) at everybody on the phone there and I'll be glad to take some of your questions. Well, thank you, and just for those who would like to question us, you were informed in your e-mails, you're invited to drop me a one line e-mail at admin@c-pet.org, just saying what you want to ask, so we can bring you in at a certain point. Free for all doesn't tend to work when you've got a call with more than a few people on it. But just drop me an e-mail at admin@c-pet.org and we'll bring you into the conversation. A couple things, Tom, thank you very much for that refresher, I read the book about a week and a half ago, so I still remember it pretty well, but not all of it. I'd like to get on a little later in the call, if you like, to the resurrection of expertise, which I assume will be the next volume, and I think that's where leads to. We'll do some sort of climbing up that hill before the hour is over, but a couple of questions for now. Talk a little about the taproots. Obviously, the internet in a sense, I suppose from my point of view, it's a catalyst, it's an accelerant, in all sorts of ways. To what extent do you see the internet, if you like, as a cause here, or at least a taproot, to what extent has it simply accelerated other trends, in which the flowering of democracy, public education, all that sort of thing was humming along very nicely thirty years ago, before we got hit by the internet. Well, at the root of all this, the radical reinterpretation of what democracy means, and I think this--one of the people I quote in the book, because I admire him so greatly, is C.S. Lewis who, over half a century ago, almost sixty years ago, talked about, over sixty years ago, talked about how democracy has become redefined to mean: "I'm as good as you". It doesn't mean a system of political equality, which is what early Americans and Canadians and Europeans, after the democratic revolutions of the 19th and 18th centuries intended(? ), it no longer just means that system of political equality for the law; it means that in every possible way I'm equal to you. I'm as handsome as you, I'm as fast as you, I'm as smart as you, my opinion is equal to yours, and of course this is palpable nonsense. As C.S. Lewis put it, of course this is speaking through his literary creation Screwtape the Demon, he said, "You know, no man who says 'I'm as good as you' really believes it because he would not say it if he did", and that's why I talk about this problem of this intersection of democratic culture and narcissism, because this notion that our democracy is that all of our outraged egos must be satisfied every time we say I'm as good as you. That was never what democracy was supposed to mean. It's also certainly not what a rational division of labor among, you know, reasonable human beings was meant to mean, but that's really we are. That's of course what populism always means, that's always the danger lurking underneath representative(?) democracy is this populace nightmare where people say that, you know, my opinion is just as good as the guy down the street, when in fact it's palpably wrong to argue that your opinion is just as good as anybody else's down the street. Talk a little about education, I mean I was just thinking back, I don't know if you remember Dorothy Sayers' essay from about a hundred years ago now nearly, on using the wrong tool in education, about the need to go back to the classics, the trivium, quadrivium, and so on. Basically, as I recall from her essay, over many years ago, is that we should be building in critical thinking tools much earlier into education, rather than all the content stuff. We tend to add the critical thinking tools later on. Part of my read of what we're discussing is that remarkably few people, despite really quite good educations, actually are able to think critically, and so they will just fasten on to stuff, but really, if they thought about it they would be able to rise above. I mean, is that part of how we should be thinking? The problem is that you can't solve the educational problem, as you pointed out, you're not going to solve it with content. Although content is always helpful, I would much prefer, you know, I began my career teaching government and political science courses thirty years ago, and one of the things that struck me was that I came out of the real world with politics, I mean I worked in national, state, and local politics, and it always struck me that young undergraduates are given these theories, and models, and this bloodless, abstract nonsense that is really pretty useless in the study of politics, so replacing that, all of that, building with the founders, and federalist papers, and Plato's Republic, would all be fine with me. The underlying problem, however, is that even if you do that, you get nowhere if you still approach education as a therapeutic matter. Somebody asked me a couple weeks ago, well, how would you encourage that more critical thinking among younger students? I said, stop telling they're awesome every day! That's a big part of it, this notion that every student who walks into the classroom is this special, unique, and their thoughts are so interesting. One of the earliest things I learned when studying kind of the big questions of psycho-philosophy and things like that was that most of my professors were not that interested in what I thought about it, and that was a really good lesson to learn because when you're 22 years old, you should be learning more than speaking. And, I always tell this story, and I tell it in the book, when I started studying graduate level political philosophy at Georgetown(? ), I had this very imposing Jesuit priest, who was also a fantastic scholar, named Jim Schall, and Father Schall would begin his class with an essay, his first day of class he handed out an essay called "What a Student Owes a Teacher". Now imagine doing that in a modern classroom, handing out an essay where the teacher explains to you what you owe to him, including, and it's in the piece, including humility, trust, docility(? ), I mean people would be burning it, lighting it on fire, they would be going berserk! I argued in this class with him, mostly about Plato's Republic, which you know, is something a serious student in politics has to read three, or four, or five times before you get it, and I passed the course, I got an A, and I went up to him at the Christmas party, after feeling my oats and feeling like I've won this great honor by getting an A in his class, and I said, Father, what do you say? Peace on Earth and goodwill(?) towards all men?, and he gave me this look over the tops of his glasses and he said, What I say to you, Mr. Nichols, is repent. And it was a hilarious moment, it was a wonderful moment because it was, you know, remember who you are and that you're a student and that you're studying and that, you know, we all live in a fallen(?) condition of human beings. I'm not Catholic, but it was kind of a classic Catholic education moment, and I think more students should have to go through a moment like that, and until that happens, when we stop telling students how special and awesome they are every day, and encourage them to buckle down and study, and possibly even to repent, that I don't think we're going to get very far on the content piece. Let's talk a little about, the anti-vaxxer is probably a good example because I mean, that's really way out there, and yet it's obviously, it's within the purview of the new administration and so on and so forth. As a sort of test case for the way in which opinion has run out of control and the divorce between expertise and widespread, popular understanding is really enormous. Is that a useful sort of case study in how that really got going? Well, I also think that the thing we can never move out of stuff like the anti-vaxxer stuff is that it's not just that people are dumb or, you know, uninformed, it's that they fight against this consensus, they fight against established knowledge, because they find it empowering, because they find it self-affirming. Because it's almost as though telling climate change scientists, or anti-vaccine people, or Russian experts, or Syrian chemical weapon experts, that you don't believe them, almost as a means of affirmation and self-actualization, and I think this is what I mean about the narcissism, that this (POOR AUDIO) show I was just on, of course we're just now dealing with the fallout of the Syrian chemical attack, and immediately the caller's like, well you experts (POOR AUDIO) and it's a false flag, and it's all part of a conspiracy, and again I think it's a reaction to saying, this thing is so horrible that I have to believe that its false because otherwise I can't get my mind around it and I feel helpless, it makes me feel helpless. You know, if a doctor says, take this syringe full of stuff that you don't know what it is, and I'm going to stick it in your child, the most precious thing in the world to you; it's empowering, it makes you feel powerful to say, no you're not! You're not going to touch my child, because someone once told me it's possible, there's a billionth percent chance that something could be wrong and you could hurt them. I mean, I'm a parent, I know that feeling, I've seen, you know, doctors stick needles in my kid, nobody enjoys the experience, but it takes a certain amount of maturity and presence of mind to overcome that, to say, look, these are necessary things. You know, I don't even like seeing my daughter in a dentist's chair, it makes me uncomfortable, it makes me feel out of control that somebody else is, you know, poking and prodding and hurting my kid, but that, I think that is a really big part of it. That is how intelligent people end up fighting against expertise; it's not that they're stupid, or that they're uneducated, or incapable of finding the truth, it's that they find it disempowering and disorienting to have to accept the truth and their egos and their sense of helplessness simply will not allow it. Thank you, that's a helpful way, I think a very helpful way of framing this sort of existential question from, you know, from the punter's experience. Now, one of the things I enjoyed in the book was your discussion of crowd sourcing and, if you like, the logic and the illogic, I mean the value and the mistake(? ), talk a little bit about that. I think that is another sort of case study in the way in which there have been some pretty fundamental misunderstandings are running through popular areas of knowledge. Well, I'm actually not an opponent of crowd sourcing. One of the books that I read some years ago, that I actually liked very much, was James Surowiecki's book, "The Wisdom of Crowds", and I think crowds, on issues that require washing out a lot of confirmation bias, washing out a lot of erroneous information, (POOR AUDIO) can actually be a really great thing! The stock market is a great example of crowd sourcing. That, you know, stock experts, the market itself tends to be more accurate than any one stock picker, and it's just like the new thing is the financial instruments, or actually, aggregate packages of, and it just flew out of my head with the call-the index funds, there we go, where you don't trade bet on one stock, but you put together a basket of things, certain technology stocks, or certain kinds of real estate stocks, and I think stock managers can figure out that that's a better way to do it than sitting there and trying to pick one winner or one loser at any given time. With that said, all that means is that when you're trying to get a read on whether a company is likely to be popular and successful or not, you might have a better shot with a million people taking a guess at it than one person. Nevertheless, if you want somebody to explain the stock market to your son or daughter in the eighth grade, you don't pull in one of those millions of people, you pull in a stock broker, or an economist, or a financialist, who says, look, this is how it works and this is how you can make those guesses even better. When people mistake the two, it's that they think that all complicated decisions are equivalent to guess the weight of a bowl or trying to guess how many playthings(?) there are in a jar. There are some decisions and there are some-you know, for example, what do we do about the Syrian chemical weapons here? Did Syria use chemical weapons two days ago? rowd sourcing is useless on that, I don't want to hear from the crowd, I want to hear from chemical weapons experts, I want to hear (POOR AUDIO) debris from a paleson(?) and from a Russian, excuse me, from a Russian-made missile from a Syrian government launcher and I don't really care what a million people think about it, and that's where the crowd sourcing thing goes off the rails. There are things that aggregated guesses are very good for, but there are certain, I think there are a lot of expert decisions that are simply not amenable to a crowd, and we've come to-even Surowiecki says himself, look, you know, saying that a bunch of experts getting together is better than any one of them is not that same thing as saying, you know, a million uninformed people taking random guesses are a good idea. I'm paraphrasing it, but that's the basic idea. Even the stock market, remember, is not made up of the aggregate decisions of people who don't know anything about anything; it's the aggregate decisions of people who are vested in the market, and I think, again, that's where people kind of go off the rails. They say, then, you know, it'll be like asking a hundred meteorologists to predict the weather, or a hundred random people off the street and you're going to get two different things from them. Well, perhaps meteorologists aren't the best example of experts. You know, the weather thing is important because how many times has a weatherman said, well, there's a seventy percent chance of rain, and then you go outside and it's a sunny day and you go, man, those guys are stupid, they don't know anything. No! It means that you're in that thirty percent zone that meteorologists understand that three out of ten times that the condition is like this, it's not going to rain. It was like predicting the election. Nate Silver had a great line, he said, look, I didn't say that Donald Trump couldn't win the election, I said that it was about a thirty-five percent chance, and remember that means that every third time there's an election, Donald Trump wins, and people have gotten this notion that experts are not experts unless they can predict everything with scientific precision, and that's simply not how expertise works. Let me bring in somebody else, we've got a caller here. Claudia Farris(? ), could you join us? Go ahead and *6 yourself and raise your question with Tom Nichols. Claudia Farris? I'm surprised because you did begin a discussion on the crowd, and what sticks in my mind is how certain Professor Nichols seems about expert knowledge, and I think we need a bit of humility in that area because expert knowledge is not so solid, it's constantly changing. The medical field used to tell women to take estrogen in place of therapy(?). Now, not so much because it's found that estrogen can be a causal factor in cancer. In quantum mechanics and relativity, those two branches of physics are still very much in conversation about what reality is and we don't know where they're going to wind up. Knowledge is a free(?) thing and one of the most important elements, I believe, in its evolution is humility, so I would be curious to know what Professor Nichols says to that. Well, thanks, that's a great question. It's a great question and it's one that comes up often. I have no problem with the argument that experts need to maintain their humility and I would argue is that the way experts do that is by submitting their work for review in the way that we do. We put our books out for, you know, peer review, and we got to conferences, and we take on our peers when they disagree with us. What I don't agree with is the notion that everyone in the world is a peer. This is the part that I think the public doesn't want to hear. Peer review does not mean everyone review, and, you know, you're absolutely right that knowledge is not static, but how does knowledge move forward? It doesn't move forward like crowd sourcing, it moves forward-what replaces a theory? You talked about quantum mechanics, what replaces a theory? A better theory. The people who tend to move knowledge and science forward tend to be the other experts in the same field who are arguing and replying each idea that comes along; rejecting or accepting new knowledge as it's created. It's pretty rare that somebody walks in out of nowhere and says, I have a random thought about rocket fuel and I'm going to change the whole notion of mechanical engineering here, and that is a, I think it's a uniquely-I shouldn't say uniquely, it's very much an American conceit(?) because I encounter it all the time and that's why in the book I talk about the movie Good Will Hunting, where, you know, there's a theory on the board...and equation on the board and nobody at MIT can solve it and then this street(?) smart janitor walks by and solves it. I hate these kinds of arguments in movies and popular conceptions more than anything because they really do encourage this narcissistic mythology that anyone is a potential genius waiting to happen. When I talk about the need for college students to study harder and finish college, you know, if they go to college, I don't think everybody needs to go to college, but when I talk about the need to finish and, you know, be disciplined and all that stuff, people say, well, Mark Zuckerburg(?) didn't and Bill Gates didn't. And I always say the same thing, guess what, you're probably not Bill Gates. You're probably not Mark Zuckerburg, and even those guys had a lot-I had one guy say to me, well, you know, Mark Zuckerburg dropped out of Harvard. And I said, yeah, but he got into Harvard first and then dropped out. Two examples. One, I had a child that I was mentoring, I guess, and I wanted to test his numeracy, so I made up a problem and gave it to him to solve, and right in front of me, never having seen the problem before, and he solved it, and I would have to say that he solved it intuitively, because when I asked him how he got the answer, he couldn't tell me. Now I made a teachable moment out of it and talked about methodology, and the usefulness of methodology, but what I recognized is that methodology isn't everything and there are intuitive insights that people can have that I don't see that will lead them to a conclusion which is valid. The second this is that I'm aware of an experiment that was conducted in a low-income neighborhood where children were given-teenagers were given access to a computer that was some sort of-I'm sorry, I'm not clear about the details about this, but they were given problem solving tools, and they knew nothing about computer science, or the methodology behind the problem solving solutions or anything, they just learned how to use it and came up with some extraordinary insights and possibilities in problem solving that were then implemented. What I'm suggesting is that there is knowledge embedded in people and we, that our own methodologies preclude our ability to experience, or to even guess(? ), and the more open we are to hearing what those sources of knowledge and information have to share with us, the richer we will be. Okay, thank you. Tom, do come back here. I wish that our biggest problem in Western society was that there are too many brilliant ghetto kids who aren't getting enough computers to solve things creatively. That's not the problem. I'll take issue with you in a couple of ways, first of all I can't speak to the first example of this bright kid you were mentoring, because again, if you want to argue from exactly that kind of confirmation bias, saying well, there's a kid who figured out a problem, I don't know how that happens and I can't speak to it. The thing with the kids and the computers, I did read about that study, and one thing they didn't (LOST AUDIO) these computers, they were given computers with very user friendly interfaces, that were designed by experts, that were already there. These weren't kids that were given machines with a blinking prompt and a blank screen. They were given machines that had objects in them, they were usable, graphically interfaceable, the kinds of things that young people love to play with. It's like we gave kids computer toys and they made interesting engineering stuff out of them. Well, yeah that's been going on for years, that's how (SOMETHING) developed, and that's how (SOMETHING) were created back when I was a kid in the sixties, and the fifties before that. The problem is with this approach is that it says, and I'm all for (LOST AUDIO), it's a great idea, the problem is we are talking about an American public with such a low level of literacy they don't understand basic mathematics (POOR AUDIO) How do we encourage unconventional geniuses? My question is, how do we get people who can't even spell or read a map to stop arguing with experts as though they know what they're talking about? We're trying to solve two different problems, you're talking about opening the door to unconventional methodologies, which I think is great, and that's what universities are for and I hope it's achieved, I'm talking about what you do about the fact that a guy in Michigan says, I'm not going to listen to a doctor because I saw a stupid Facebook meme and I think I'm smarter than a doctor now. Claudia, thank you for joining us. If anybody else wants to join in, drop a quick e-mail to admin@c-pet.org and we can find time to bring you in. Tom, I'd like that you push past this a little bit here and I think one of the reasons why the more intelligent doubters of experts have a lot of grit to their mill over the last twenty to thirty years is diet. Because here, of course and the thing is multi-factorial, and the studies and we know all about the problems of the studies, but basically you had such an enormous reversal on the part of experts, these(?) experts reporting to government, government recommendations coming out, being overturned, and so on, a whole series of times, the safest course was to exercise, and now we're all (CANNOT MAKE OUT) reversed from last time. Now, what's interesting about these two areas of diet and exercise, other than that they're related and multi-factorial, but of course it's that they affect absolutely everybody, and it's something we read about in the waiting rooms, we read about them in the magazines, and so on. And I think, I mean, one of the conditioning factors I think for the skepticism about expertise, lies precisely in these areas, which really has applications on everybody. People obviously have views on other things, but here people's lives have been affected by experts basically going haywire. Now, can we talk about that? I take issue again with the popular conception that world has gone haywire (POOR AUDIO UNTIL 42:28) tell you a bit about my own background, because I do not come from an elite background, I come from factory town in Massachusetts my parents had to drop out of school during the depression, I don't come from a long line of doctors of physicians or anything like that, but this notion that the world has gone haywire, it really makes me grind my teeth because (LOST AUDIO) I love eggs, so I was pissed off that I spent a lot of years avoiding eggs only to find out that they're nutritious and healthy for me. Nonetheless, on almost all other things, your doctor is still a better advisor on your diet and nutrition and general health than the guy next to you at the movie theatre(?). People are living longer and healthier than they ever have before all around the world because of experts doing things right. And people say, yes, but they were wrong about eggs! Okay, nonetheless, they're still right about millions of other things that seem to be making you live longer and healthier. There are forms of cancer that were a death sentence when I was boy, that are now considered an (LOST AUDIO). There are procedures and techniques and medications that are, to somebody who grew up in a poor town in 1960, the equivalent of miracles. My dad had a very mild heart attack when he was fifty-five years old and they put him in a hospital for three weeks in a tent(?) because they were trying to figure out how you treat these things. Today, people can go back to work in two days. I mean, this is really a remarkable thing and people are constantly focusing on, yes, but what did they get wrong? You know, what's the flaw in that airjet(?) that made the pilots make a mistake and crash into the ocean? Ignoring the billions and billions of safe miles flown to remote edges of the globe. I mean, in a way we have become like spoiled children about this, we have become almost infantile, our expectations of expertise (POOR AUDIO) really don't go wrong. I point it out to people who have talked about medical professionals making mistakes with drugs, I finally have my research assistant go look it up. Americans take something around 300,000 different over-the-counter medications in the Western world that are perfectly safe every day, and yet when I'm starting(?) the book people are like, well you're going to talk about solidifies(? ), right? Solidmites(? ), which happened in the 1950s, before I was even born, when airplanes still had propellers and (POOR AUDIO) and of course I had to mention it in the book (POOR AUDIO) talk about medicine and people are like, for one thing, they will never ever forget, despite fifty years of advances in medical science, they think the same things happen. Let me just push this in the realm of politics for a moment, the Western hemisphere is, for the first time in decades, it's at peace. When the the entire Western hemisphere was at peace for the first time in generations. The fact of the matter is when President Obama, who is not somebody I supported, but who I think was right about this, when he said, look, the world is a lot less quiey(? ), a lot less dangerous that it was forty years ago. He empirically-that was true, and when people say, you experts (POOR AUDIO) I look at a world of peace, and prosperity, and cooperation that no longer rests on the hair-trigger of The Cold War that produces a manner of living that is astonishing by any human standards, it makes you say, okay, what is it that we didn't do that you're so angry about at this point in the realm of politics, in the realm of economics. Did we make mistakes? Have we gone off half-cocked on some idiotic conflicts? Have we made some bad bets(?)? Of course we have! We are fallible human beings, but this constant whining about, you didn't get this one right, you didn't get that one right, in a world that I find unimaginably bountiful and peaceful compared to the one I grew up in, blows my mind, and as you can see it kind of steams me a bit because it's all transparent to the average citizen. The average person (POOR AUDIO) says, you know, the world is going to Hell in a handbasket and I look at them and say, all that means is that you're not happy with the circumstances of your life right now, because nothing in the world has gone to Hell in a handbasket. We have become so self-absorbed and so (POOR AUDIO) that everything that is happening to each one of us becomes the whole world at any given moment, and because we have to blame somebody, we say, well let's blame those shadowy(?) experts who have screwed us over somehow in ways that I don't even understand myself. Well, let me bring in one expert, my colleague, Dr. Nagy Hanna who is one of our senior fellows, former head of corporate strategies and The World Bank, Nagy Hanna? Nagy Hanna you can join us now. *6 yourself and the floor is yours. Okay. I agree that there is a lot in the concern(?) that has led to complacency and, what you may call, narcissism or spoiled, average citizen in respecting or understanding science, but some universities argue also and say that maybe the experts have failed the average citizen in a number of ways, and have served special interest in the process. And I look here particularly in economics or social sciences, where a number of predominant series related to the benefits of free trade for example, which is ignored very much the inequality it is creating, or the lack of shared prosperity, and yet most of the economists for some time have been primarily talking only on the positive side of this and ignoring the negative side. In a sense, what I'm saying is that there may be a need for accountability, not only by experts, but also from the society at large to question the experts, whether they are doctors, on diets and other things like that, or whether it is about the economic benefits of certain policies and so on. Can we talk a little bit about that other side of the equation, to what extent expertise or the experts have themselves, being servants of vested interest, (CANNOT MAKE OUT) undermining respect for expertise and science. Well, yes, and I believe in transparency and accountability and one of the reasons that I am so angry with the American public(?) is that they do not educate themselves enough to be able to hold its experts to be accountable. They are not, again, they are almost resolutely unwilling to educate themselves in even basic geography or mathematics or economics to be able to question(?) experts, and I think experts end up making these decisions and colluding with special interest by default, because there is no accountability, because the public simply can't, doesn't care enough to participate in its own government, and its own public life. Now, it's simply not that complicated; this lack of participation and education of the public is something we're able to trace empirically over forty or fifty years and people, you know, I've had people say to me, for example, well, how can I be more informed? How can I be a better participant in this? And I say, well, read a newspaper in the morning, and they go, well, that's all biased and I don't believe it, and second, I don't have the time. Well, you know, if you don't have the time to read the newspaper every day then I don't think a professional economist or physicist or political scientist has the time to answer your questions. Why should we? You didn't bother to do even basic (CANNOT MAKE OUT) some of the literacy that you need to ask the question, and that's within the power of every citizen and they are abdicating it. I say in the book that while I worry about the (LOST AUDIO) populism(? ), I'm also worried that democracy will decay into technocracy because the experts are simply going to get tired about asking people, who don't know anything, what they want, and I think in The United States in particular the issue of accountability is very important (LOST AUDIO) for example, The Gulf War. People said, well, you experts, you experts told us that there were weapons and to do this and where was the accountability? And when I say, well, you reelected George Bush in 2004, that was your accountability. You didn't wipe out voting for that war, you didn't choose to not-well, that was different. We made decisions that we retroactively regret and now we want you to take responsibility for them. Well, it doesn't work that way. You don't get to have a morning after-look at Brexit, right now! The people who voted for Brexit are already waking up and saying, well you experts told us-well, the experts told you not to do this, and you did it anyway, and so now you've created yourself a real problem. Well, whose fault is that? And I think that if citizens are going to take back accountability, then they're going to have to impose some self-discipline on themselves, stop watching reality T.V. all day, and read a damn book. We're obviously coming toward a conclusion now. I'd like to have you talk a little bit about the role of the public intellectual, because plainly, part of one of the key pieces of the jigsaw here are those, are the experts who communicate, who take very seriously their role, in whether they're writing op-eds, whether they're lecturing in public, whether they're doing baroque stuff, but the people from within the, almost everybody in the expert community is never directly exposed to the general public. Focal part of intellectuals are, and at different levels, whether it's, you know, bloom or whether it's somebody at a much more popular sort of level, but I'd like to talk a little bit about that, and about how that's part of the solution. Well, I think the role of the public intellectual is really important and part of the reason I wrote in the book, try to at least step into the role a bit myself, and here experts have to take a lot of the blame, because the university system for example (LOST AUDIO) public intellectual the right to a very accessible way for the public. And dammit, I can both tell you stories about how young (LOST AUDIO) unacceptable form of academic activity that serious academics did not write(?) (LOST AUDIO) and engage in this kind of nonsense. We were told that, as serious intellectuals, Dan was at Chicago and I was at Dartmouth, you know, we were told that our only audience should only be other intellectuals within our respective academic communities. And I pushed back on that hard, and I paid a price for it early in my career, but I'm glad I did, and I think universities and graduate schools have to stop being, what the military-the American military has a wonderful expression, "self-licking ice cream cones", which means a project that exists only to serve itself. With that said, I think the other problem that public intellectuals face is too many of them sign on to political causes too obviously, and immediately become identified, not as public intellectuals, but as partisan pundants(?) and I think that's a mistake. I am resolutely partisan in a lot of ways, I both opposed, even though I'm a conservative, I oppose Donald Trump very publicly, and in my writings. I think there is still a way to be an honest broker(?) without lying about your politics, but typically, public intellectuals who have chosen to get on one team or the otherand to stay there and it hurts their credibility. With that said, it's the public's responsibility to listen. It is amazing to me how quickly just this, and again I think it's narcissism and ego and resentment, the minute you appear on television, before you say a word people say, well, you were on television so you're a liar. I was on CNN a couple of days ago and people said, oh, you went on Jake Tapper's Show, so you're obviously just a lying, talking head, before I even said a word! It just, you know, sort of appeared there. So, I think public intellectuals have to get those, have to start showing up for work, if that makes any sense, they have to get out there and take their lumps, and they have to shout back at the public, and I think they have to occupy that ground. The public intellectual is a big part of the solution here because I think they're the lubricant(?) in the expert community and the layperson community, but (POOR AUDIO) is something I'd be willing to take the punches that, you know, I've taken, that Dan's taken, that other public intellectuals have taken and I think that's a very important part of the job, and I think if we do that enough and wrestle with the public enough, we might be able to get somewhere, but let me tell you, it's not fun. I think that the academic community has more respect for that role of the public intellectual, because right now young academics are trained never to be public intellectuals, and I think that's a terrible mistake. Now I think that's extremely helpful survey of the tour de (FRENCH) public intellectual question. began quoting C.S. Lewis, who, in a sense, was one of the greatest public intellectuals of the twentieth century, before that term became, you know, a term of art, but who was a very closeted, technical scholar, who would then get on the BBC and have everyone listening to him back during the war years and so on. Let me get to our closing couple of minutes. Just looking ahead, obviously we're in a complex cultural, political situation in the moment here in the U.S. and there are movements in Europe and so on which are reflecting some of those same sets of concerns, but if you could look ahead, look ahead ten years do you think we're going to pull out of this? Do you think ideas are going to become more cogent? The expert communities are going to become more credible? People will attend(?) more, or do you see things spiraling? I don't know, I mean I tend to be more pessimistic. I think that the expert community will recover, I think that expert communities always recover, which is to say, in the wake of a disaster. You know, the anti-vaccine nonsense, that'll end during the first pandemic where, you know, whooping cough or measles start killing kids again. I always tell this story, I was vaccinated, my parents had no problem vaccinating me against polio because we knew people with polio; that was within our living experience. I think people forget that the 1930s, for example, was a period of high populism, where experts really weren't listened to, and that produced a global depression and isolationism and a league of nations that the United States joined and that the average person didn't trust. Then after the destruction and collapse of World War II, the experts built an entire international, economic, and political community that did pretty well. Germany and Japan here, experts rebuilt Germany and Japan into highly functional, advanced democracies rather than the warlike empire they once were, and I think, unfortunately, I wrote the book because I don't want that to happen before we have to learn our lesson, but I think, you know, Brexit really, interestingly enough, I was not a fan of the European Union. I'm by nature and by temperament I'm a conservative, I don't big trans-national, governmental bureaucracies, but the way Brexit was done, I think at this point in history, threatens the peace of Europe, and I kind of wonder, is it going to take another European war before, you know, British populism learns its hard lesson here. I think ten years from now, a lot of the generation of people who are stomping around in their late 50's early 60's, who have been complaining about experts, will have passed from the scene either to retirement or passing away. I have a lot more faith in the younger generation which I think will just be much more open, going back to Claudia's point about alternatives, epistemically open-mindedness and all of that stuff-I suppose, there's a (POOR AUDIO) there, I'm just hoping that the generational change happens before the disastrous change does. Well, that is a very sobering note on which to end. Before we wrap up, just a word that we have our next one of these teleconferences in fact next week at the same time, when we will be having Jim Giordono from Georgetown, one of our senior fellows at C-PET, speaking about neuroscience in relation to the political security intelligence and military implications, which is a catchphrase now being used within the neuroscience plus community, that will be our next conversation. But I do want to encourage those who have joined in to read the book. I think it's a terrific book, it says a lot of what Tom Nichols has been saying here, but it has a good deal more length and with a good deal more sophistication and I think it's an important baseline for discussions we need now to get into about the resurrection of expertise. Tom Nichols, thank you very much for joining us, we're just delighted that you've been able to and thank you very much for your effort and the fact that you've taken these risks to move into the public intellectual space and move off your discipline and raise some of these fundamental questions, because I think this is a very significant contribution, thank you very much and thank you all for joining. Thank you very much for having me, it was an honor to join you.